Light ruby color – a bit of cloudiness to the wine, but nothing off-putting. Aromas of red fruit – cherry, raspberry, cranberry, Oregon strawberry (the little ones you get by the roadstand and nowhere else because they don’t travel well), with sweet spicebox. Flavors of red cherry and raspberry with just a hint of oak barrel (cola and caramel). Exceptional balance; soft, velvety tannins, and an extremely long finish. Before we get into the note – it was not my intention to age the wine as long as I did. I had actually placed it in a converted refrigerator in my garage where I stage my early drinking white wines and Champagne. The fridge is set to it the warmest level I can get it to without using a converter, so it runs between 45 and 50 F. One thing led to another, and the wine was forgotten until this past Friday. The was pale straw in color and star bright. The nose was relatively muted, but hinted at Granny Smith apple and an almost herbal peppery note. On the palate, there was a mix of stone fruit (peach and apricot) with honeyed citrus. There is a slight minerality on the finish. Despite the age, the wine shows a vibrant acidity. Wish I had some more of these “happy accident” wines! Not your typical Zin, and certainly does not remind me of anything I have had from Howell Mountain in quite a while. Ruby in color (almost Pinot-esque), with floral, spice, and red cherry and plum fruit aromas. Red fruit dominates on the palate, with spicebox and some white pepper on the finish. The wine is well balanced and, despite a label-specified 14.8% alcohol, does not come across as hot. Nor does it show the glycerol typically associated with such levels of alcohol. I got a telephone call on a recent Thursday afternoon, inviting my wife and I to join some friends on the following Saturday and try a restaurant that was garnering a lot of praise from local foodies – The Chef’s Table at the Edgewater Hotel in Winter Garden, Florida. Winter Garden is a sleepy little citrus town 15 to 20 minutes west of Orlando. The town has seen a recent renaissance through the renovation of its downtown, which is both bicycle- and pedestrian-friendly, and lined with interesting little boutiques and restaurants. The menu is a three course prix fixe, with three to four options per course. Thoughtfully selected wine pairings are available for an additional fee, and the restaurant allows diners to bring their own wine, with a $20 corkage fee. We began our dining experience with a 2002 Philliponat Champagne, and decided that the optional cheese plate would be a good place to start while we pondered the rest of the evening’s fare. The plate offered five cheeses, consisting of a triple cream brie, aged gouda, and Spanish manchego, as well as a cheddar and a blue. 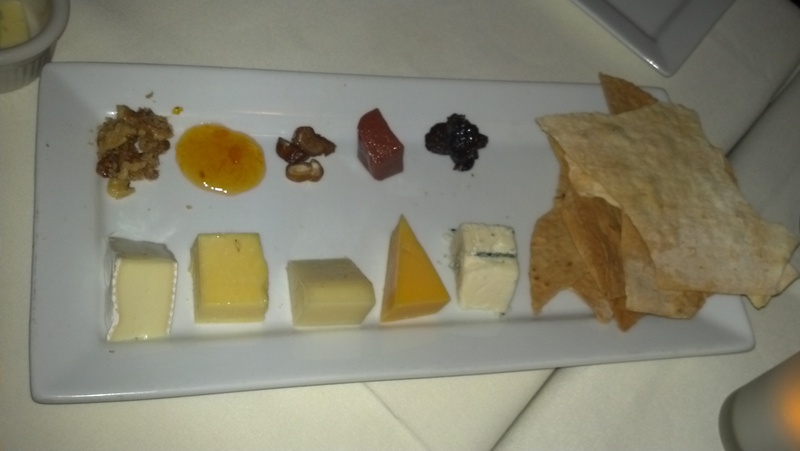 Accompaniments included candied walnuts, apricot preserves, dates, figs, and housemade lavosh crackers. After Chef Kevin explained the menu to us, we made our selections. 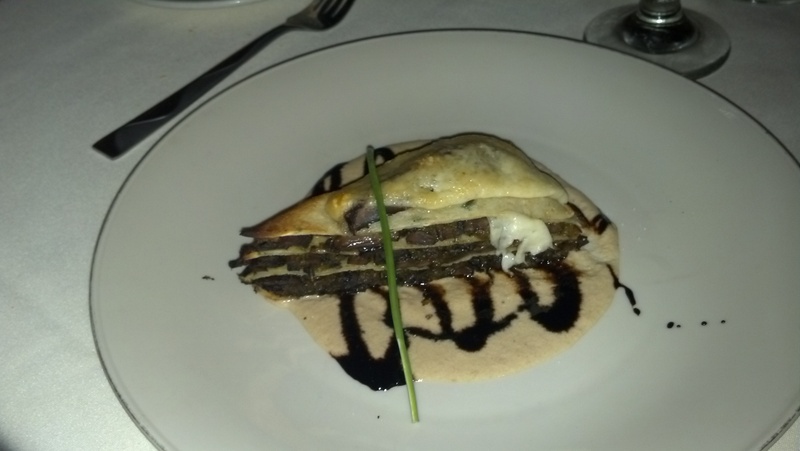 My wife chose a mushroom and chive crepe torte, with a roasted shallot cream and truffle salt as her appetizer, while I chose the foie gras crème brulee. These were the popular choices with the rest of the group as well. Readers may recall that I had seen foie gras crème brulee offered on a menu recently, and had been disappointed with the execution. After hearing the chef’s description, I decided it was time to get back on the horse. The custard was slightly sweet and contained pieces of sautéed apple and shallot and, once bruleed, was topped by a seared slice of foie gras. The chef had noted during his description of the dish that he had originally spike the custard with diced liver, but had not been happy with the consistency of the dish given the temperatures necessary to set the custard. This version of foie gras crème brulee was everything the earlier dish was not. The custard was rich and flavorful with the bits of apple and shallot, and the seared liver was perfectly done. 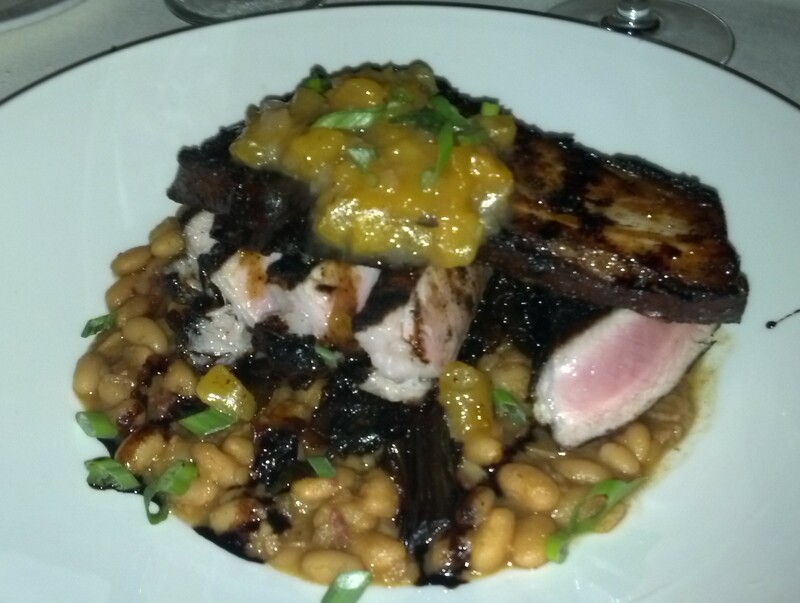 This dish was not short on foie gras flavor. The torte was full of mushrooms and had a nice bite from the chives, and the shallot-flavored sauce added just the right touch. The only negative voiced by the table was that the dish could have used a touch more salt. We mentioned it to Chef Kevin and he noted that he is a “salt monster,” and therefore tends to scale back a bit. There were three options for the main course – pan-seared yellowtail snapper with roasted fingerling potatoes, baby bok choy, house-made eel sauce, and cherry and peppadew peppers; braised beef short rib Wellington with a blue cheese/red wine demi-glace; and, a house-cured smoked Kurobuta pork chop, with habanero-peach chutney, white bean cassoulet, candied collard greens, all topped with a strip of pork belly. Given the group and our diverse tastes, all three dishes ended up on the table. 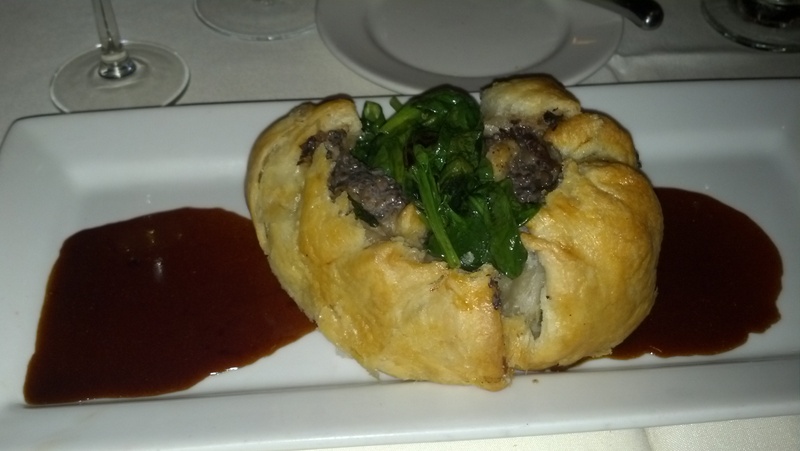 I had chosen the Wellington – it came to the table split open, dressed with both the demi and blue cheese 9melted from the residual heat of the dish), and topped with wilted spinach. The meat was fork tender, succulent, and perfectly accented by the sauces. My wife had opted for the pork dish – probably the best of the three mains… The pork was cooked to a moist, slightly pink, medium rare, the chutney had the just right balance, but I think the star of the plate were the greens, especially to a Mississippi girl like my wife. The collards had been prepared in the style of German red cabbage, with sugar and red wine vinegar, so that the yin-yang balance extended to all aspects of the dish – tender pork and soft rich cassoulet with the crispy skin, sweet and sour in the greens, and the sweet and heat of the chutney. 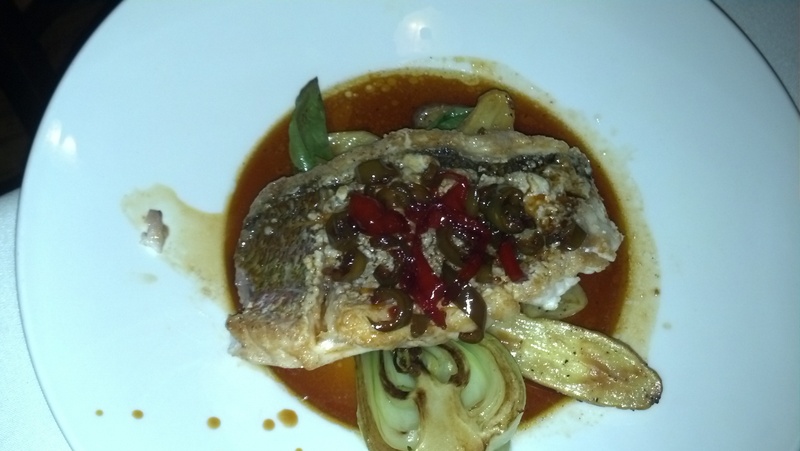 The fish was a thick, skin on filet, again cooked perfectly so that the fish was moist and fork tender. The spice and mild heat of the peppers over the top of the fish played a nice counterpoint. Our tastes were varied when it came time for the dessert course – we selected three of the four options. Chocolate mousse cake with fresh berries, almond amaretto marscapone cake, and port poached pears with citrus-vanilla French toast all appealed the diners at our table. I think that the best of the desserts we tried was the almond cake, again showing the exquisite balance of flavors and textures that characterized the entire meal. The poached pears were also good, with a balance of sweet from the port and the French toast, and tang from blue cheese, although given the poaching, and the subsequent24-hour maceration in the poaching liquid described by Chef Kevin, one would have presumed that the fruit would have been softer – it required a knife to cut them. The chocolate cake was dark, dense, and rich, layered with the mousse, and then sauced with a red fruit coulis and sliced strawberries and raspberries. All in all, we enjoyed the dining experience and the insight into each of the dishes provided by the interaction with Chef Kevin, Laurie, and their staff. I would recommend the Chef’s Table to anyone looking for a high-end dining experience. The added bonus is that this experience does not necessarily come with a high-end price tag. Oregon Pinot – All the Same??? Everyone has their favorite wines. Some of these are based on the country of origin or the particular viticultural regions in which the grapes are grown, some are based on varietal. I really enjoy Cabernet Sauvignon and Pinot Noir. While Cabernet Sauvignon’s flavor profile varies based on where it is grown and how it is treated in the vineyard, it only has a little more than a dozen clones for the vineyard manager and winemaker to choose from. Pinot Noir is just as sensitive to growing region and how it is cropped, but Pinot Noir has a couple of hundred clones; more if you include the non-red clones (Pinot Blanc, Pinot Gris, Auxerrois, etc.). Surely there are differences based on growing region, from the microclimate, to soil type, elevation, exposure, etc., but particularly the clonal selection within the vineyard plays a huge role in how the terroir is translated or expressed into what we perceive in a glass of Pinot Noir when there are so many clonal options. Many of the early Oregon vineyards were planted to the Pommard clone, the Wadenswil clone, and/or the Coury clone of Pinot Noir. The Pommard clone (4A, 5) was first introduced to North America in the 1940’s, from cuttings taken from Chateau de Pommard, the longest continuous vineyard in the Cote d’Or region of Burgundy. The wines produced from these vines are valued for their deep pigmentation, concentrated fruit, marked spice, and velvety texture. This clone lends itself both to be a blending component, or a stand-alone wine. The Wadensvil clone (1A and 2A) was imported into the U.S. in the 1950’s from Wadensvil, Switzerland, and current estimates are that approximately 30% of the Pinot Noir vines in Oregon are the Wadensvil clone. This vine performs well on sedimentary soils such as the Willakenzie, Laurelwood, and Carlton soils typical in the Ribbon Ridge and Chehalem Mountain AVAs, as well as in the areas north of the towns of Carlton and Yamhill. The vines do tend toward over production, but with proper management and dropping of green clusters, will yield wines marked by bright red cherry fruit character, spice box, and floral aromas. This clone excels as a component in blends, adding high end accents. The Coury clone (4) is alleged to be a “suitcase” clone, supposedly smuggled into the states from Germany in the 1960’s by the late Charles Coury, who planted one of the first Pinot Noir vineyards in the Willamette Valley in the mid 1960s. The black tea and spicy components that characterize this clone lend themselves to blends with the Wadensvil clone. Tous Droit (UCDavis 18) is one of a group of Pinot noir selections that have been known as the Gamay Beaujolais type, which are characterized by high vigor and an upright growth habit. All five selections in this group were derived from the same single vine source at UC Davis. A large number of the Pinot Noir vineyards throughout the United States are planted to Dijon clones. According to many sources, Domaine Ponsot in Morey-St.-Denis served as the original budwood source for these clones. Introduced in North American in the late 1980’s, these clones generally tend toward early ripening, with fruit forward qualities and a general tendency to benefit from being blended in some combination rather than as monoclonal wines. 113 – typically seen as an aromatic component with very high-toned elements in the nose. When properly managed, the wine can possess nice weight and body as well. In comparison to clones 114 & 115, 113 is the highest yielding, with the largest clusters. 114 – sometimes overlooked despite the fact that it is very dark, soft, and rich, making it a great cohesive element to the final wine. In comparison to clones 113 & 115, clone 114 is the lowest yielding, with the smallest clusters. 115 – reputedly favored in Burgundy for its production consistency. The most widely planted Dijon clone in North America due to its good perfume, rich texture, full flavors and notable red fruit characters. Clone 115 works very well on its own. La Tache (828) – delivers low yields with small berries marked by dense pigmentation. Currently experiencing a significant surge in planting similar to clone 115. Reputed to produce very dark, rich wines. Potentially appropriate to be produced on its own. 667 – offers inherent firmness, excellent aromatic complexity, and marked impressions of blackberry and plum. Tannins are strong and often angular, contributing great cellaring potential. 777 – conveys up front black fruit flavors in a fairly tannic framework, adding age-worthy qualities in blending. Below average production results in high quality fruit. There are as many opinions of the optimal blend (or not) of clones in a vineyard and in a bottling as there are bottles on shelves. I have found that careful consideration by both the vineyard manager and the winemaker makes all the difference. The more I strive to learn about what is in the bottle of wine I am drinking, the more I realize that there is as much art as there is science, and that there are so many more details to be considered than most people realize. My wife and I and another two couples recently visited a local restaurant for a pre-holiday meal. Restaurant cognoscenti refer to holiday and pre-holiday meals (Valentine’s Day, Christmas Eve, New Year’s Eve) as “amateur nights,” where folks who do not typically dine out come out in mass, or even frequent restaurant diners step up a level or two for the special occasion. The restaurant had offered an enticing three-course pre-fixe menu (appetizer, main, and dessert) with choices to please carnivores, pescivores, and vegetarians alike. The menu included high ticket items such as foie gras, Maine lobster, and Wagyu beef among the choices. At $45 per person, we thought it was too good to pass up, even on amateur night. We had chosen the earliest of three seatings at the restaurant, as we had plans for later in the evening and did not want to arrive for New Year’s Eve festivities on an empty stomach. We also figured that the early seating would be the least hectic for the restaurant and that we would see the restaurant at its peak while they were fresh. We were shown to our table and we settled in. Several tables were already seated and were in various stages of dining. After several minutes our waiter appeared and welcomed us, and said he would get us some menus. We asked him for some Champagne flutes, as we had brought our own. He came back a few minutes later with two menus, handed them to one couple, and wandered off. He reappeared a few minutes later with another two menus, and announced that he was having trouble assembling menus for the table. Given that this was the first seating on a pre-fixe menu, we found this quite odd that there were not enough menus available. When we all had menus, he asked if we wanted to place our orders. We stated that we were still waiting on the Champagne flutes, and that some water would be nice as well. After another few minutes, he reappeared with Champagne flutes; we were somewhat mystified by the amount of time that it was taking, as the restaurant advertised that the meal would come with a complimentary glass of Champagne, so they should have had the stemware staged. When the water was brought to the table, it had an odd, and decidedly fishy, aroma. Curiously, future refills on the water did not have this aroma. 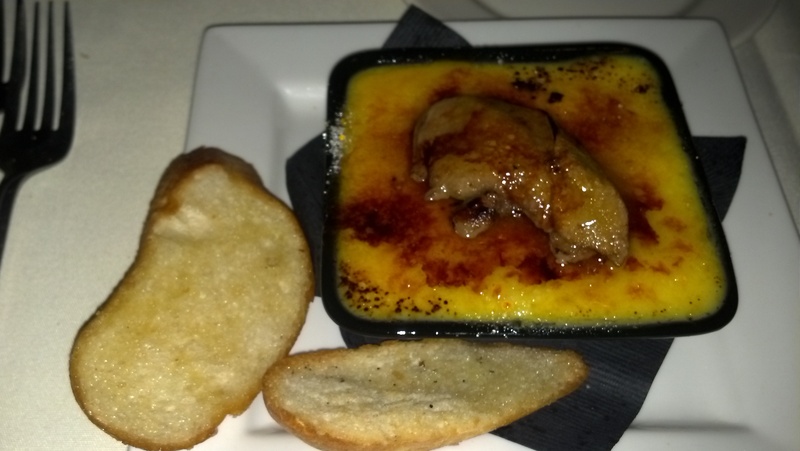 We finally placed our orders, with the majority of us ordering a foie gras crème brulee, which sounded intriguing. The brulees arrived, accompanied by a savory sage biscotti, preserved fig, and dressed microgreens. The crème brulee was subtly flavored with the foie, although we thought that there should have been a bit more evident in the mix. The crisp sage biscotti added a nice texture and flavor counterpoint to the smooth and creamy brulee, and the fig was simply amazing. We paired this dish with a bottle of 1997 La Tour Blanche Sauternes, always a smart and easy pairing with something rich like a crème brulee, and especially with the addition of foie gras. With this as the opening salvo, we anticipated great things for the evening. For the entrée, the majority of the table ordered the Wagyu ribeye, with one ordering the lobster. While waiting for the mains to arrive we sampled a couple of red wines that we brought for the occasion, including a 1997 Dominus and a 2001 Silverado Reserve Cabernet Sauvignon. The entrees were quite slow coming out of the kitchen, and the waiter stopped by the table at least twice to explain to us that another table was in front of us. When the entrees arrived, we were all surprised by the presentation. The steak was a relatively large piece of meat, but was only ½ inch thick. Not what we expected. Upon cutting into the steak, we found that all of them were cooked beyond the requested doneness. Not all that astonishing given the thin cut. I decided that my steak was close enough to not send back, but other steaks were sent back to the kitchen. The dish had additional issues… the steaks, as well as the vegetables that accompanied… were all overly salted. The vegetables that accompanied the lobster dish were also heavily salted. When the desserts arrived, the problems continued. My wife had ordered the “Bananas Foster” which did appear in quotes on the menu and was described as “house made vanilla bean ice cream, seasonal fruit.” What was placed on the table was a bowl of white, room temperature liquid. Upon examination, there were pieces of banana submerged in it, but they gave no indication of being sauted. My dessert choice was “Dark chocolate & Grand Marnier molton cake, with a house made mint crème frâiche.” Crème fraiche seemed an odd topping for a chocolate lava cake, but I was game. It turns out that I was not a fan of the crème fraiche, but it was more the flavoring that I had a problem with. The crème fraiche was not mint, but a combination of dill and tarragon; again, not things that I would match with chocolate. All in all, we were disappointed in the performance of a restaurant where we had previously had fabulous meals, and that had been lauded near and far by critics and foodies alike. I am hoping that our meal was an anomaly for the evening, and that other diners fared better. I am actually eager to go back to see if, in fact, it was a momentary glitch, but several of our dining partners have indicated that they have no desire to return. This 1er Cru (from plots in the Cote de Blancs village of Vertus) Champagne is made in a style that is at once both food and quaffing-friendly. Full bodied, creamy mouthfeel with a nice light, bready, yeasty note and some chalky minerality. Nose of green apple, white flowers, citrus, caramel, and almost a cinnamon spice note. Palate continues with the apple and some stone fruit. Fine and persistent mousse, long finish.